Create deeply-grooved icing patterns on your cakes, cupcakes, pies, and more with this Ateco 847 9/16" closed star #26 pastry tube. Made of durable stainless steel, this tube is rust-resistant and designed to withstand repeated use without bending out of shape. Featuring a closed star tip, you can create shells, stars, fleur-de-lis, rosettes, and flowers. The closed star design produces a defined texture for eye-catching bakery decorations. Plus, its large size is perfect for icing confectionary creations quickly and efficiently. Using the right sized pastry tube for the job will enhance your presentation to draw patrons' attention to your display cases and plated desserts. I love this company. There the best when it comes to all of my baking needs. Fast shipping, awesome product quality. I will always shop with this company!! This product itself is high quality as with all Ateco piping tips, but I do want to express some frustration about the way it arrived. There appears to be old adhesive all over one side of the piping tip including very near to the prongs where the frosting would be piped out. Normally WEBstaurant Store is great about putting the adhesive label on the bag that covers the product or even when it's directly on the piping tip it seems to be recently placed so that it's easy to peel the adhesive off without residue. I hope this was a fluke as it worries me to have residual adhesive on a product used close to food. Thank you for your feedback! We’re sorry you had issues with shipping. Your concerns have been forwarded to our Customer Solutions team. That one perfect icing tip that you've been needing for cupcake swirls and much more. I love Ateco for the quality. Worked great! Good for doing larger projects. I really like this Ateco 847 #26 Closed Star Piping Tip (August Thomsen). It's the perfect size to decorate mini cupcakes and cakes by making beautiful rosettes. This is a very good quality product and the price makes it a easy decision. This is one of many closed star tubes that I use for a number of decorating task. This #26 tube is versatile and provides me with many options with just one tool. This is a great value if you need a large, closed-star icing tip. I personally like this one for making swirls on cupcakes. Great price! If your anything like me than you don't have any decorating skills. But when using 9/16" #7 closed star pastry tube, this make any at home Baker look like a pro! Closed star #7 pastry tube is one of the bigger once. It creates a rather large design that stands out on cakes or cupcakes. The pastry tube is made out of high quality material that will last for a long time. It is also very easy to clean. Our pastry chefs love having multiple shapes and widths of pastry tubes to decorate their desserts. This pastry tube is great for decorating cakes, cupcakes, and other desserts. This pastry tube has a 9/16" wide tip and features the closed star shape. This product is made by Ateco, a very reputable manufacturer of pastry tools. Ateco 847 9/16" Closed Star #7 Pastry Tube (August Thomsen) is a necessity to decorating, you'll always need thinner ones to outline and ones like these to fill and cut down on time. These pastry tubes are perfect for decorating all of our desserts from cupcakes to cakes! The opening is wider which makes styling easier and this is sold at a great price! Great tip. Nice wide opening. We use for butter stars on our B&B plates for fine dining nights. Easy to clean up and keeps it shape after months and months of use. This closed star pastry tube is super easy to use. It makes beautiful decorating easy for you! Just fill bag with icing and put pastry tube inside and then squeeze icing out! Awesome larger closed star tip. The quality and reliability of Ateco with a reasonable price. I have several of these tips to use with many colors. perfect pastry tube. Easy to use and clean. Planning on buying more in the future. they get the job done and its fun to use also. The Ateco 847 9/16" Closed Star #7 Pastry Tube (August Thomsen) works great for decorating cupcakes. The quality is excellent as well as the price. This is one of my favorites. I definitely recommend this pastry tube. I use this tip for mini cupcakes normally. However it works well on tortes and cakes on the top piped in a circular motion. They work great and fit with a medium sized coupler. These Ateco pastry tube is great for decorating cupcakes, cupcakes and much more....it's also perfect for piping. A little too big for intricate detail work but I strongly recommend this item. Great tips ! They are my most favorite to use for frosting my cupcakes! They create a large and thick frosting top with a pretty pipe. Our 6 inch cakes call for slight,y larger borders and we often use this closed star tip just for that. We are planning on ordering more soon. This Ateco tube/tip has a larger opening. It is good for the bigger designs and fuller frosting on cupcakes. It uses the large size coupler. Nice large closed start pastry tube. Makes our piping quick fast and easy. Makes perfect looking cupcakes every time. Made to last a long time. Great price. I'm new to Ateco tips, but absolutely love the quality. The closed star tip lends to nice drop flowers and other cupcake decorating techniques that make the cupcakes look extra special. I will order these again. You can never have too many piping tips. The metal tips that we use at our bakery are all Ateco brand and some of them we've had over 10 years!. These tips are highly recommended. Great pastry tip for piping closed star shapes. It is big so make sure to get the correct sized bags and use for larger surface areas. The metal is strong which makes them last longer. Need to re-order more, great value for your money. Multiple designs from one tip fits perfect in disposable bags and easy to work with. No regrets just satisfied clients. I use these to pipe cupcakes and to pipe reosettes on cakes. Easy to use and clean. Only thing I wish was better was if they would not put the item sticker on the top as it is really hard to remove. A well made tip by Ateco. A nice BIG tip perfect for quickly icing cupcakes or even making designs on cakes. Very nice quality and can't beat the price. Good quality. Holds up to our daily demands and constant usage. Great product for an even better price. I would recommend to anyone who is looking for pastry tubes. Love using this large size tip to frost cupcakes. Makes the job easier and faster not to mention that the closed star is a very nice design. What fun it is to use these pastry tubes by Ateco! Frosting my cupcakes with them is a breeze. The quality of these tubes is very nice and the price is great too. THIS TIP.OMG.ITS LIFE. i LOVE THIS TIP. You can do SOOO MANY DIFFERENT THINGS WITH IT!!! its sturdy does the job and does it WELL!! The Ateco 847 closed star tip is the go to tip for shipped cream toppings. I don't own a NO2 cream dispenser, but this dispenses whipped cream with an extremely pleasing appearance and light texture. My favorite piping tip of all time. Very durable and very sturdy. It allows large amounts of icing to come through tip. I think it should be in plastic then have the sticker. It leaves a nasty residue when you tear it off/ Other than that its nice. We have been adding to our tip collection and we really like this size for larger bakery items. It is a large pipe and looks great. 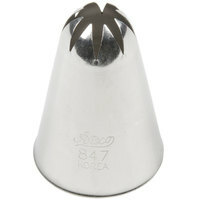 The Ateco 8 4 7 is a dupe large fun tip which I used for piping roses on top or medium or large cupcakes- really top choice! A very nice pastry tip for the price! Fast Shipping, great product! It will do the job well! Webstaurant always delivers quality products, thank you! i ordered almost every decorating tip that webstaurant has, these are bigger than just the normal small wilton ones but i am excited to have some that are a little bigger! Using this tip gives a softer elegant touch to my cupcakes. I can get all my flavors through with no problems and makes my job a lot easier. Great quality piping tip. The closed star design is cut out neatly. My favorite tip for frosting cupcakes. Great for piped borders on cakes as well. Very affordable Pastry tube made by Ateco. Easy to clean and fits standard pastry bags. Great for cupcake swirls and making stars and flowers for cakes. This is a great pastry tip for making small star borders! It is a good replacement item if you lost this #7 tip in a set!! Very good quality. Hard metal, very good cut makes perfect shapes. I don't have any trouble using it or cleaning it. Great product. Highly recommend it.